Lift-Crane Service in Omaha has been providing crane services, equipment rentals, consultation and crane accessories for over 40 years. 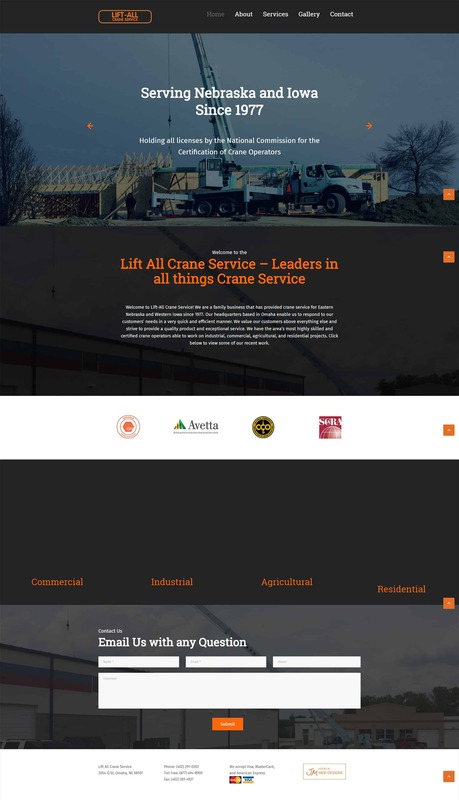 Partnering with our web design Omaha team, Lift-All Crane Service needed a website to accurately reflect its brand and provide information to potential customers. A simple website, with 4 pages and a contact form, this website is intended to provide basic information about services and experience. Originally a pre-built WordPress template with mobile-friendly technology, this website was an affordable way for Lift-All Crane Service to redesign their website meeting Google’s standards for a mobile-friendly website. It’s our hope that Lift-All sees great success through this website redesign and continues to see growth in the Nebraska and Iowa marketplace. Google Chrome and Firefox have rolled out changes that affect all websites not using a secure connection (HTTP). As part of a gradual change, when users pull up an HTTP page with a form including passwords or credit card fields, they will get a warning indicating an unsecure connection. HTTPS is shifting to the new standard. As security risks become increasingly prevalent, users will be warned if any form transaction is insecure. And, moving forward, all websites will be flagged as unsecure if not HTTPS, no matter a website’s features. Our Omaha web design and web hosting team can assist in securing your website and ensuring an HTTPS connection and compliance to these new security standards. For $180/year our web hosting support team will purchase an SSL certificate and install it on your website, ensuring all visits and features of your website are secure. Call us at 402.292.7500 ext. 102 for more information.